Map courtesy of Sierra Leone Petroleum Directorate. Since the discovery of the giant Jubilee oil field off Ghana in 2007, interest in the transform margin sector of West Africa has been high, further encouraged by recent discoveries off Senegal and Mauritania and the belief that Sierra Leone’s offshore waters may contain proven petroleum systems that are conjugate to major discoveries in South America. Considerable interest is therefore expected in Sierra Leone’s fourth licensing round, which was announced in late October and which will take place between mid-January and the end of May, 2018. The round will be exclusively supported by the Getech Group through its wholly owned subsidiary ERCL. The company will operate a data room containing 15,000 km2 of 2D seismic, more than 10,000 km2 of 3D seismic, including PSDM volumes, and all the wells from the 2009–2013 drilling campaigns, together with value-added products built by Getech using the government’s released 3D seismic and well data. Exploration for oil and gas in Sierra Leone started in the mid-1980s with two shallow water wildcats, which had oil shows but were plugged and abandoned, possibly because of the depressed state of the industry at the time. Fast-forward to 2002, and the opening of the first offshore bid round, which was backed up by improved understanding of the subsurface based on a 5,800 line-km 2D survey which had been undertaken by TGS in 2001. The second round followed in 2004–2005, when three blocks covering about 17,700 km2 were offered, and in 2012 a third round offered eight blocks, some of which were oversubscribed. The areas to be explored are normally demarcated in blocks of at least 2,000 km2 and offered for a period of 30 years. 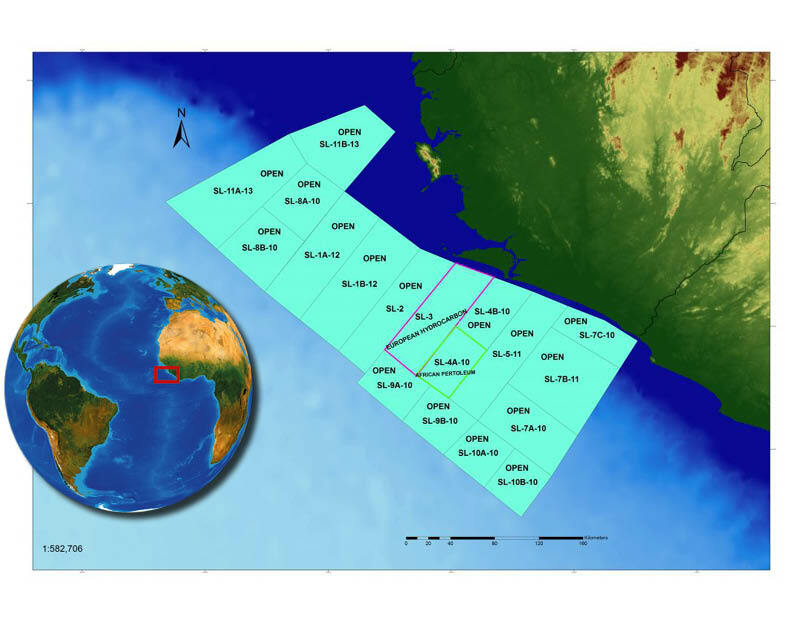 At present the acreage offshore Sierra Leone is divided into 18 blocks, only two of which are under licence at the moment. The first discovery in Sierra Leone was Venus-1B, drilled in 2009 in 1,800m of water, followed by Mercury in 2010 and Jupiter in 2012, all found by Anadarko. Two further wells have been drilled offshore since then, one of which had shows, so the offshore area could correctly be described as underexplored. As explorers in Asia Pacific undertake the search for high-cost deepwater-targets, global production levels remain high and oil prices slump. This article investigates the impact on these deepwater projects.